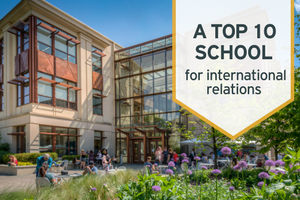 In February, Foreign Policy magazine once again ranked the School of International Service (SIS) in the top tier of international relations programs around the world at the undergraduate, masters, and PhD levels. Developed with the Teaching, Research, and International Policy (TRIP) project at the College of William and Mary, the Ivory Tower Survey is based on responses from more than 1500 international relations scholars. The SIS masters and undergraduate programs both rank in the top 10, with our masters program placing eighth and our undergraduate program ninth. The growing strength of our PhD program, directed by SIS Professor Sharon Weiner, is emphasized by its rise into the top 20, placing 19th this year. "This recognition from our peers is gratifying and is a testament to the transformational research conducted by our faculty and the hard work of both staff and faculty. It also reflects the high caliber of students who choose to come to SIS and the impact of our alumni. I'm proud to be part of the work that we do here," said Interim Dean Christine BN Chin. Foreign Policy releases rankings every three to four years. This year's rankings come at a time of international uncertainty, largely attributed to the Trump administration's disruptive approach to foreign policy and international order. Regardless, SIS's more than 3,000 students see important roles for themselves and for a robust US presence in global affairs. "Right now, studying international relations is one of the most important things you can do. It's not so much understanding what's going on in the world, but it's also understanding why those things are happening, if they've happened in the past, and how we can make sense of what's going on in the world," said Kristina Biyad, SIS/MA '18. SIS masters programs-both on campus and online-are still accepting applications. For more information, contact sisgrad@american.edu.